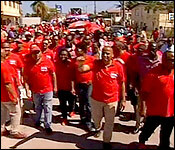 Municipal elections are only a month away, and, in two weeks, the political parties will have their first chance to flex their muscle on the streets of the different municipalities. That's February 21st., nomination day. It's a political carnival full of scenery and mass party noise, but the day is really about a simple process: filling out a nomination form, getting two registered voters to nominate the candidate, and paying a deposit of fifty dollars. 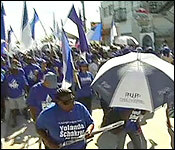 Nomination will be held at public offices and locations in all the cities and towns, namely: the Charles B. Hyde Building, in Belize City, the Civic Centre, in Belmopan, the Administration Building in Corozal Town, the Sub-Treasury, in Orange Walk Town, the Administration Building in San Ignacio Town, the Town Hall, in San Pedro, the Town Hall, in Benque Viejo, the Town Hall, in Dangriga and the Administration Building in Punta Gorda. There are 67 seats up for grabs - and we expect about 150 nominations total from mass parties and independents.